I'm writing the 33 1/3 book on Aphex Twin's album Selected Ambient Works Volume II. Prepare for an uptick here in mentions of Aphex Twin for the coming six months to a year. I’m signing on to write a book about Aphex Twin’s landmark 1994 album, Selected Ambient Works Vol II, for the excellent 33 1/3 series. If all goes according to plan, the book should be out in time for the album’s 20th anniversary. Here, for reference, are the first 69 in the series. So far there have been 86 books from 33 1/3, most recently Jonathan Lethem’s on Talking Heads’ Fear of Music. The proposal process for this Aphex Twin book included several steps, among them a request for a rough draft of the introductory chapter. I’m posting mine here (at the bottom of this post), with the understanding that it’s the introduction to a book that it is yet to be written. Almost certainly the introduction to the finished book will read differently. I almost certainly won’t be starting a separate Tumblr for this project (which is what I did at sound.tumblr.com for the class I’m teaching at the Academy of Art this autumn), just posting here at Disquiet.com on occasion, and of course on various existing social-network satellite operations (twitter.com/disquiet, facebook/disquiet.fb, etc.). I’ve added the tag “saw2for33third” to Disquiet.com track the book’s development. There’s a good chance I’ll be visiting England at least once if not twice to research this book, so if you’re there and want to meet up, let me know. I haven’t been to England since 2009, and I will try to schedule a Disquiet Junto concert during my visit. At the near midpoint of Aphex Twin’s 1994 collection, Selected Ambient Works Volume II, a wind chime peeks through the album’s lush and pervasive haze and makes itself heard. The chime appears as a sequence of routinized figments in the final track on the first of the album’s two sides. That’s track 11 of 23, for those listening along at home to one of the U.S. editions of the album’s post-vinyl era. With just one exception, the works that constitute Selected Ambient Works Volume II are untitled, and this wind chime track is not the exception. We hear the wind chime, but we don’t hear any actual wind. There is a brief, passing moment of whizzy, slipstream, sci-fi ether; it’s like something that might accompany the jettisoning of waste — or of a fallen colleague — in deep space by the Starship Enterprise. This ethernoise is synthesized, fleeting, “false.”The wind chime, by contrast, sounds “real,”even in the absence of wind. It’s a wind chime resounding in a closed chamber, a specimen on clinical display. The chime introduces its characteristic rhythm. The device itself is nothing special. It’s standard issue. It’s the same wind chime that dangles from a neighbor’s porch, situated fittingly right between a dream catcher and a flycatcher: between the mystic and the functional. The chime introduces rhythm, but the rhythm is loose at best. It’s a rhythm-less rhythm, in that it lacks a discernible downbeat. The chime cycles through, its pattern a marvel of a unique phenomena: the very pattern-less-ness reveals itself as pattern. There is no beat in the traditional sense of a beat. What there is is a series of beat-like segments that collectively suggest a kind of whole: in place of meter we have a metric temperament. The track depends on a droning, slowly developing tonal center for any sense of compositional structure. Yet in its beat-less-ness and its tonal drift, the track still feels like a song. And like any proper song, it has a vocal, but such as it is, the vocal is merely snippets of voices in plausible conversation, “plausible”because the voices are garbled, as if heard through the wall from a neighboring room. Even when this strange music agrees to speak, it muffles its message. Such is the nature of the remote pleasure — and an often delirious pleasure it is — of Selected Ambient Works Volume II. The wind chime originates from a distant time, a time even further back than 1994. The wind chime was known to the ancient Greeks as an aeolian harp. The harp was named in honor of Aeolus, the god of the wind. The wind chime is, by most accounts, the original “generative”instrument. It is the original device that serves dual essential purposes: as composition and as tool. To create a wind chime is create a musical composition in physical form: it is to set down rules (the relative number and frequency of notes) that when enacted by a player — by the wind or, if you tend toward the mystic, perhaps by Aeolus himself — result in something sonorous, something melodic, something song-like. The remoteness of this something is, to borrow from another Greek myth, tantalizing. Eno, born 1948, is the man who named and codified ambient music, a form — generally from the realm of electronic music — that works intentionally as both foreground and background. Aphex Twin is one of several monikers employed by Richard B. James, born 1971, and James is the man who resuscitated, who re-envisioned, ambient music for our beat-pervaded time. His is ambient music for the digital era, an era of countless synchronized millisecond metronomes. Selected Ambient Works Volume II, released at the outset of that era, is his masterpiece. When we speak of masterpieces, of canonical record albums, we speak frequently of them as being “timeless.”But in the case of Selected Ambient Works Volume II, this timelessness is as much a factual matter as it is one of collective, consensual, received affection. 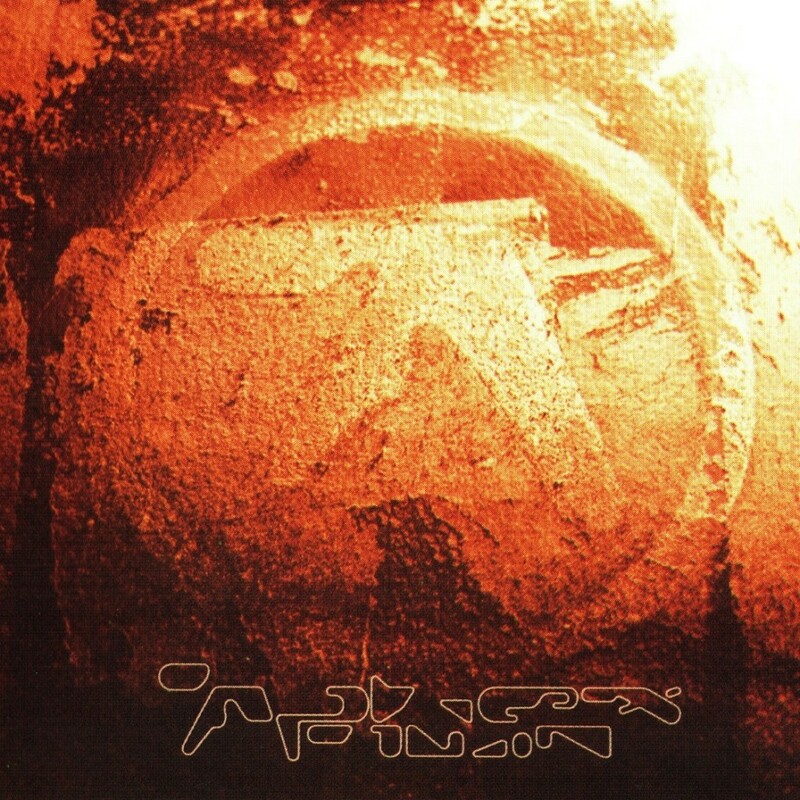 That there is something “timeless”about the music of Aphex Twin on Selected Ambient Works Volume II is a matter of authorial intent: it was a compositional goal, a functional goal, a practical goal. It was a compositional goal born of a desire to explore the ambient quality of the beat, to take that which was considered anathema to ambient-ness and to subsume it in an ambient milieu. (The piece of music that follows the wind chime one has a consistent, static pulse, pixel-wide and pixel-deep, as if someone had forgotten to remove the production click track before sending in the tapes for mastering. The beat is so repetitive it becomes invisible if not inaudible while the music, otherwise gauzy as passing clouds, proceeds.) It was a functional goal in that, as ambient music, it sought to create an illusion of time, or better yet to illuminate time as an illusion. And it was a practical goal in that the music had a specific utility: it was intended to be played in “chill rooms”at raves, safe sonic spaces for the exhausted, spaces set apart from the intense sounds that dominate such events. Selected Ambient Works Volume II may be timeless music, but it is still very much a product of its time. I will, in this book, try to simultaneously celebrate its timelessness, and also to delineate the time period in which its creation was predicated. In this book we’ll listen closely to the album, and we’ll listen closely to those who have themselves listened closely. We’ll benefit from their concentrated imaginations and their diverse perspectives. The book draws from interviews I have done with Aphex Twin himself, and with musicians closely associated with him. These range from electronic musicians who have remixed his work to classical composers who reverse-engineered the record’s textures so they could be performed by chamber musicians on “traditional”instruments. It also checks in with filmmakers and with DJs who have infused Aphex Twin’s music into their own work, and with various of his labelmates (from Warp Records, which has released the majority of his music, and Rephlex Records, which is his own concern) who witnessed firsthand the era, the time, during which this music took shape. As an album, Selected Ambient Works Volume II persistently evades the sort of consensual understanding that is usually accorded full-length recordings of note. There is no agreed upon favorite track. There is no remotely satisfying cocktail-banter pithy summary. It’s a monolith of an album, but a Kubrick-style monolith, one that reflects back the viewer’s impression. As a sonic artifact, the album isn’t truly silent, but it is extravagantly vaporous. Unlike Kubrick’s monolith, Aphex Twin’s Selected Ambient Works Volume II is built from thin air. It is an intense album of fragile music. This book is an attempt to document that very fragility, to collate its fuzzy meanings, to make note of the shadows cast by its unapologetically loose forms. The music is messy, blemished, and muddy, and often feels incomplete. The album’s absence of track titles (with one exception) means that its abstract sounds are not even abetted by the associative meanings that titles might provide. In the place of those titles are images, but the images vary by the manner in which the record was released: in the U.S. versus in its native United Kingdom, in digital versus physical form, on vinyl versus on compact disc. Like an especially delusional conspiracy theory, these images offer more questions than answers when they are probed. The cover depicts a logo, a stylized A, more militaristic than corporate. It looks like the markings on a spaceship discovered in the desert. And those are just the stories in which Aphex Twin, in which Richard D. James, is himself complicit. Like any record, great or otherwise, even one as formally intentional as this one, Selected Ambient Works Volume II tells stories beyond its own intention. To understand the moment in which the record was released, it’s essential appreciate how at that moment the record industry was betting on electronic music as the “next big thing,”and it’s essential to note how despite the quixotic nature of that quest (“quixotic”may be an indelicate term, because this was a quest born of nothing but commercial self-interest) electronic music managed to become the ubiquitous cultural force it is today. It’s essential to note how uncommon, how unfamiliar, the term “ambient”music was at the time of the Aphex album’s release. It’s essential to understand how the then-nascent World Wide Web was not the dynamic communal discographical engine it is today, and how the nature of online communications at the time assisted in Aphex Twin’s murky self-mythologizing. And it’s important to focus on the pre-MP3 world of music, and what it meant for such ephemeral sounds as those that comprise Selected Ambient Works Volume II to have been encased in the cultural Carbonite of vinyl and compact disc. These are just a few of the things I’ll be digging in to. And with some two dozen tracks as sprawling as they are remote, lush as they are reticent to reveal themselves, Aphex Twin’s Selected Ambient Works Volume II is an album that readily serves as background music to its own telling. The Assignment: Make music from a sample page of Beck's Song Reader sheet music. One of the underlying tenets of the Disquiet Junto is the exploration of music as something that is not simply listened to or performed — that the divide between audience and artist is more porous than the modern traditions of the music industry tend to suggest. The term “modern traditions” is intended here in contrast with older traditions, such as the campfire sing-along and the parlor piano. Add to those older traditions the way that songs once were transmitted primarily as sheet music, interpreted free of any doctrinal/canonical audio recording. It’s an idea that never went away — sheet music continues to be prepared and sold, and “guitar tabs” for popular songs are traded online with no more or less regard for copyright than are MP3s — but one that recently gained additional attention thanks to Beck’s announcement that he will release this December an “album,” titled Song Reader, solely as a set of sheet music. An advance promotional image from Beck’s Song Reader (shown up top) will serve as the source material for this exploration. 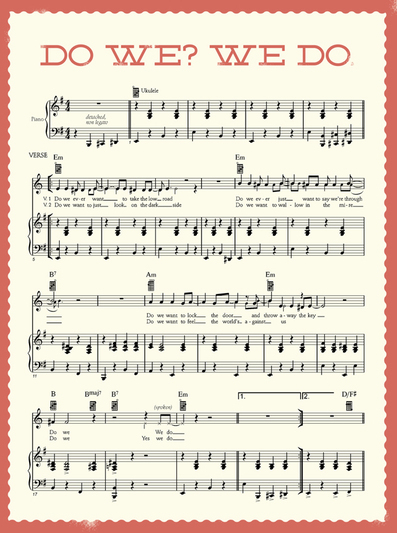 The fact that sheet music provides its own sort of content shift — changes that take effect unintentionally as a result of copying, transmission, transcription, dispersal, and translation — is explored here in that the source material is of low resolution, and appears to simply be a portion of a complete song. The assignment was made early in the afternoon, California time, on Thursday, August 30, with 11:59pm on the following Monday, September 3, as the deadline. View a search return for all the entries as they are posted: disquiet0035-becksongreader. Deadline: Monday, September 3, at 11:59pm wherever you are. Title/Tag: When adding your track to the Disquiet Junto group on Soundcloud.com, please include the term “disquiet0035-becksongreader”in the title of your track, and as a tag for your track. Lords of the Last Man experiment with the direction of entropy. The core parts of “Darvaza” are a study in contrast: a thick, wooly drone and a microscopic, chattering beat. Whether the drone subsumes the beat or the rhythmic ticking cuts through the voluminous sonic tapestry is up to the listener. It was posted by Lords of the Last Man, aka Kav, hailing from Birmingham, Britain, whose SoundCloud account includes the brief description of modus operandi: “sonic experiments around ambience and ideas of signal degradation, noise and entropy.” The question becomes one of which is more entropic: a cloud slowly settling or an energetic element tunneling its way through, unabated. Track originally posted by soundcloud.com/lordsofthelastman. Panel discussion: "Performed Art: The Fluid Roles of Spectator and Artist in Sound Art"
I’ll be moderating a panel at 7pm at the record store Fingerprints (fingerprintsmusic.com), which is located at 420 E. 4th St. The subject is “Performed Art: The Fluid Roles of Spectator and Artist in Sound Art.” We’ll be discussing the concept of “performance” and how it relates to sound art. To take just two examples among many: What makes a concert a work of sound art, and what are the roles of the “audience” and “performer” in installation art? We’ll draw examples from the works at SoundWalk, notably those produced this year by the panelists, among other pieces. The goal is to illuminate telling parallels and resonant dissonances between the various participants’ conception of matters of performance in sound art. View SoundWalk 2012 in a larger map. More details at soundwalk.org and at facebook.com. Colin Smith and Simon Elms provide "sound design as score" in Luke Scott's sci-fi film. Loom is a short science-fiction film by writer-director Luke Scott. Scott is the son of director Ridley Scott and the film is, in various ways, the offspring of one of Scott’s great achievements, Blade Runner. It’s as much a matter of setting (dystopian future) and characters (a scientist and his mysterious house guest) as it is of plot (manufactured lifeforms). The score to the film, which is about 20 minutes in length, is particularly effective. Its credited to Colin Smith and Simon Elms, who for the first three quarters provide something more akin to sound design than score — or, more to the point, sound design as score. The music heard in the film could very well simply be an enhanced recording of the environments in which the film is set: the audio from the ventilation systems of a laboratory and a stark apartment complex. Certainly, the sounds are heightened and given tonal and rhythmic structure, so perhaps it’s more to the point that it’s as if we’re hearing the sounds of the environment as discerned by the main character — the ventilation triggering, or reinforcing, his anxiety, claustrophobia, and scheming. As a nice touch, the pulsing with which the film opens brings to mind a heartbeat, telegraphing the story that will follow. This “sound design as score” is the case for the first 15 minutes or so in Loom, at which point the film’s climax begins, and the score becomes more formally musical, more conventionally musical. These things are purely relative, of course. The score remains gauzy and hazy as the climax gets underway, but the synthesis is readily apparent. More to the point, there’s no longer a material correlation between what’s heard and what is seen, and thus the score takes on a more traditional role. This final segment comes across more like a synthesizer being played, and the music at this stage brings to mind mellifluous passages of the original Blade Runner score by Vangelis. The closing credits feature a vocal that seems to have been put through a lightly glitchy filter. (The credits include this line: “Punjabi Folk Song performed by Mrs. Mohini Bangera.”) Given what occurs in the film, it’s touching to hear a woman’s voice, especially one that has been conjured to seem partially artificial. The film was shot on the “RED EPIC in 3D” system, and serves as a showcase for the digital technology. As a note at red.com states, Loom is intended to be viewed on a laser projector, but the web version was posted for general consumption. More on the film at deadline.com. Located via io9.com. More on the film’s composers, Smith and Elms, at eclectic.tv. The song in the credits is sung by Mrs Mohini as it says. She is a the mother of a gentleman I met through work in Mumbai. She sat and played tabla and sang for us at her house before having dinner and gave me some recordings she had made of her singing old traditional songs. We took sections of the recording and manipulated it both to make it useable and slightly unusual as the majority of the score is. I mainly used Melodyne to get the effect and then of course harmonised it with several guitars to get the right emotional content.